Jerry dates Abby and is interested to learn that she has a mentor. When he meets Abby’s mentor, Cynthia he finds out she is actually dating Bania. 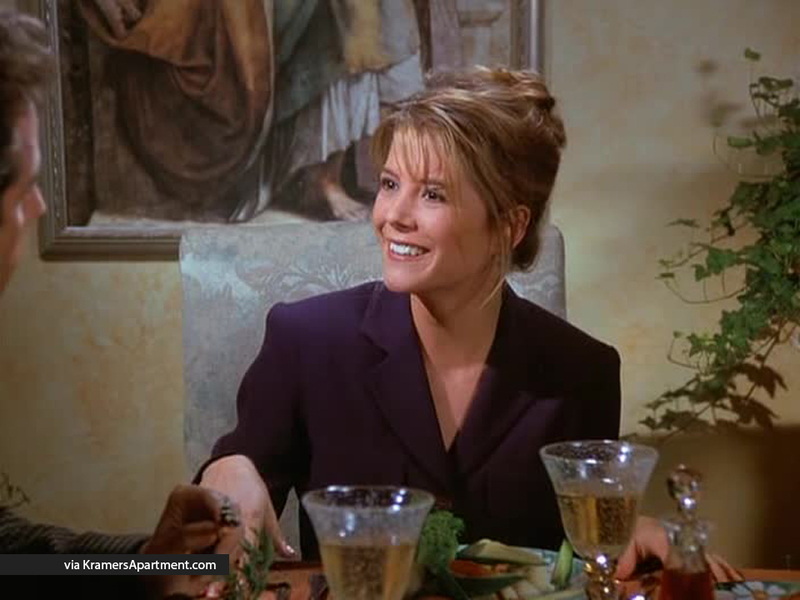 After seeing Bania’s act, Abby loses respect for her mentor and eventually fires Cynthia which causes her to dump Bania causing him to turn to Jerry for advice, and Jerry agrees to be his mentor. At the same time, Abby looks for a mentor and ends up choosing George. Jerry: I’m not really a duck fan, the skin seems sort of human. Abby: Oh! Look who’s here, Cynthia! Cynthia: Great, my boyfriend’s just parking the car. Actually, Jerry, you night know him, he’s a comic too. Abby: I think there’s a dead animal in the elevator. Abby: I told Cynthia we’d double with her and Banya Saturday and then catch his act. Jerry: No. No, no way, no Banya. Jerry: Have you seen his act? He’s got a twelve-minute bit about Ovaltine. He’s a punk, a patsy, a hack. Jerry: So you saw Banya’s act? Abby: He got two minutes into that Ovaltine thing and I just couldn’t take it anymore. Jerry: I told you, it’s like getting beaten with a bag of oranges. Abby: Anyway, Cynthia and I got into this big argument afterwards and I think it’s over. Abby: Actually I was kind of thinking that maybe we shouldn’t see each other for a while. Abby: Well I’m feeling a little disoriented. It’s just weird for me not to have an advisor. Abby: No, it’s more than that. Jerry: I can’t believe you feel you really need a mentor. Abby: I just need someone who can give me some kind of direction. I’ll see ya. Abby: And you’re sure with your busy schedule you’d have time to take on a protge? George: I’ll make time, because Abby, I was once like you; wide-eyed, naive, I didn’t know the first thing about a subject as fundamental as risk management. Abby: I’m not familiar with that, you’ll have to explain it to me. George: I’ll tell you what, why don’t you read this book and let’s just see if you can explain it to me. Abby: Yeah, he’s great! I am learning so much. Abby places her risk management folder on the table. Jerry: As a matter of fact, I happen to have a protg of my own. Jerry places his Banya folder on the table. Jerry: A Mister Kenneth Banya. Jerry: I’m gonna mentor this kid to the top. Abby: Huh, well, I don’t think I want to date a mentor whose protg is a hack. Jerry: Well, I don’t think I want to date a protg whose mentor is a Costanza.